Timing is everything -- especially when it comes to crossing the mean streets of New York. 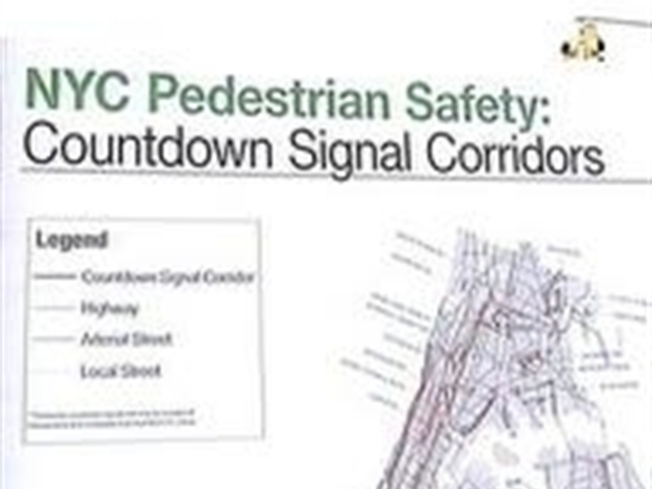 Now, hundreds of New York City crosswalks will be getting pedestrian countdown clocks. From Park Avenue to Queens Boulevard, some 1,500 city intersections are getting the signals to help millions of pedestrians know how much time they have to cross streets. Mayor Michael Bloomberg and other city officials on Monday announced the new signals would be phased in starting this month after a pilot program at 24 intersections. "Crossing the street shouldn't just be a judgment call," Department of Transportation Commissioner Janette Sadik-Khan said. "And these kinds of countdown signals really help take the guesswork out of getting across our corridors safely." New York is a city of pedestrians — just 45 percent of households own cars, compared with about 91 percent nationwide. It lags years behind other major cities in getting the countdown clocks. Officials said it took time to study and figure out whether the signals were helpful in New York, the nation's largest city, with more than 8 million residents. A small 2006 pilot program was inconclusive, so the Bloomberg administration launched a larger pilot last year, using video cameras to track how pedestrians responded. The city's standard crosswalk signal features the outline of a person walking in white lights, a hand flashing in red lights and then a solid hand in red lights. The countdown clock, next to the standard signal, features numbers in red lights. Officials found that the countdown clocks helped reduce the number of pedestrians still in the crosswalks when the lights were about to change on wider streets such as Queens Boulevard, a major thoroughfare in Queens as much as 12 lanes wide in parts. The signals had no effect on narrower streets. And so, the city has selected 1,500 intersections to get the clocks, based on their roadway width and high rates of accidents with pedestrian injuries. Installation will begin this month on the first 250, and the rest are expected to be added within a year, the city said. On downtown Manhattan's 14th Street, where test signals have been in place, 74-year-old resident Rita Dulberg welcomed the news just after making it to the curb with seconds to spare. "I feel safer crossing because I know how long I have," she said. "Otherwise, as it's turning, I'm never sure I'm going to make it." Officials also announced other measures to improve pedestrian safety, including a pilot program of 20 mph zones in some residential areas. The city's standard speed limit is 30 mph.